Welcome to the Nintendo Wii Reviews section of the site! I'm sure that like most of us, you're looking for that perfect Wii game, right? I know how busy everyone is these days, so unlike most big video games websites, I only review Wii games that have received high scores from the games industry, or have received critical acclaim in the press. Putting only the best Nintendo Wii reviews on my site helps save you loads of time and effort searching for that perfect game. If the game review is listed on this page, you're guaranteed it's worth looking into. Even with so many good games available (and with new games being released all the time), it still takes a lot of time to read all the reviews and decide which game to buy. But not here - all of my Nintendo Wii reviews have a short Video Game Summary block at the beginning of each review! The blue Video Game Summary block lets you decide in 30 seconds if a game looks interesting. If it catches your eye, then continue reading the full review below the Summary block. If the game doesn't do it for you, simply return to this page and check out a different Wii game. No matter what type of game you're looking for, my Nintendo Wii reviews give you an honest, independent review of each game. If you're not sure where to start looking for games, simply go to one of my theme pages. The 10 Best Games – If you're looking for the perfect game, then my Best Wii Games page is a great place to start. This is my personal list of the 10 best games around. Each game has a short description to help you choose your favourites. Wii Sports Games - Nintendo Wii reviews of the best Wii sports games, no matter which sport or team you follow. Wii Fitness Games - Reviews of the best Wii fitness games, and details of how to choose the right fitness game for you. Lego Video Games – The Lego series takes famous action movies and re-creates them as video games where all the characters and levels in the game are made entirely from Lego! The Lego video games are a real smash hit with video game fans. With so many great games on the Wii you're bound to find something that's just right, so jump into the Nintendo Wii reviews below and find the perfect Wii games for you! Start by reading my list of the 10 Best Wii Games. 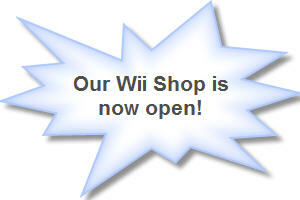 Find free Wii Flash Games using the Internet Channel.